The United States and Canada share a continent and many common interests. Not least is a passion for snowmobiling. When it comes to trail riding, many of the most popular areas are within a snowball's throw on either side of our shared international border. That makes them easily accessible to any American or Canadian snowmobilers in search of cross border sledding adventures. For Ontario riders, prime stateside choices from east to west include New York's Tug Hill or Old Forge, Michigan's Upper Peninsula and Northern Minnesota. U.S. snowmobilers coming to corresponding areas of Ontario can be on the snow in Eastern Ontario, The Grey Bruce, Algoma Country or Northwestern Ontario in no time. 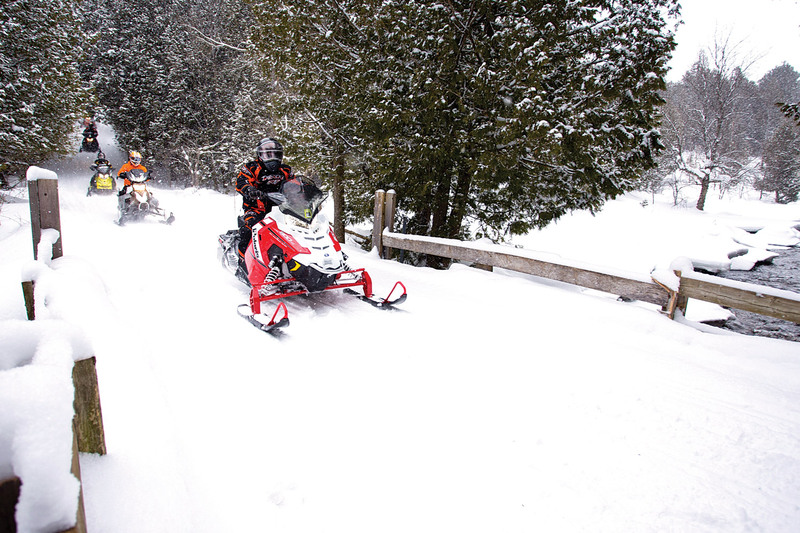 AmericanS choose Ontario snowmobiling for many good reasons. 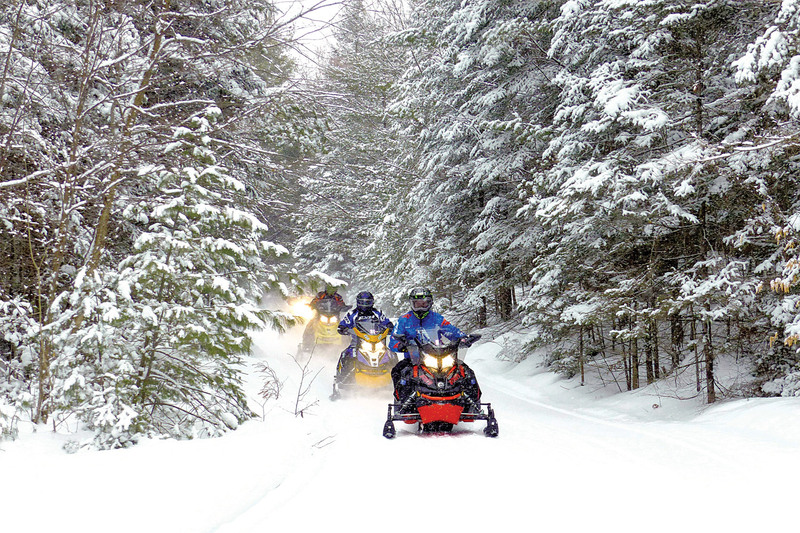 This English-speaking province has a world class trail system operated by the Ontario Federation of Snowmobile Clubs (OFSC). There's generally way less traffic on its almost 19,000 miles of trails. Signage, mapping and services are plentiful. U.S. riders can save about 25% on everything thanks to the high value of their dollar and if you visit Ontario on the Try Our Trails weekend of February 3 & 4, you can pre-register online for a no-cost, two-day permit (and to extend your stay, supplement it with an inexpensive two-day permit). Getting back and forth either way by road across the international border at designated checkpoints is straightforward if you’re properly prepared. For identification, adults need a passport and kids need birth certificates. You’ll also need your driver's license, plus registration and proof of insurance for your tow vehicle and trailer. Sled owners need registration and proof of insurance including third party liability coverage. It's also good to have a specific destination (maybe even an advance reservation) and know how long you intend to stay. 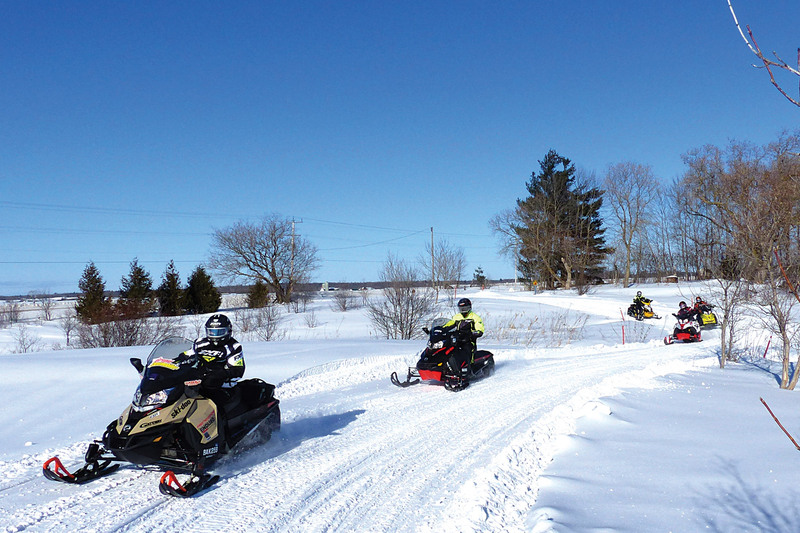 Now known in sledding circles as the Upper Canada Snowmobile Region, this area is located across the St. Lawrence River from Upper New York State. It offers almost 2,500 miles of excellent trails that wind through farm country, woodlands and rural villages. Distance From Border to Nearest Trail: Under 5 miles. Where To Ride: Do your own self-guided ride or follow the signs for one of the region’s three OFSC-promoted Snow Tours - the French Connection Loop (186 mi), the Upper Canada Circuit (162 mi) or the Rideau St. Lawrence Run (150 mi). You can add distance to each of these established circle tours by exploring some of the many side trails or mini-loops along the way. Positioned on the eastern shore of Lake Huron, Midwestern Ontario is blessed with abundant lake effect snow and criss-crossed with over 1,800 miles of groomed trails through rolling farmland, backwoods bush and welcoming villages. This snowbelt area is home to the popular Grey Bruce Region, including the famous Bruce Peninsula. Distance From Border to Nearest Trail: 92 miles. Where To Ride: Navigation is easy on this region's six OFSC-promoted Snow Tours - Aprés Harvest Tour (134 mi), Bruce Peninsula Tour (120 mi), Huron Gateway Tour (110 mi), Queens Bush Tour (115 mi), Saugeen River Tour (163 mi), and Walters Falls Tour (88 mi). These self-guided tours are adjacent to one another, so you can ride them individually or in whatever combination fits your available time and distance. With 2,000 miles of groomed trails sweeping through the rugged terrain and ancient growth forests of the Canadian Shield, Algoma Country stretches from the north shore of Lake Huron into the northern wilderness. 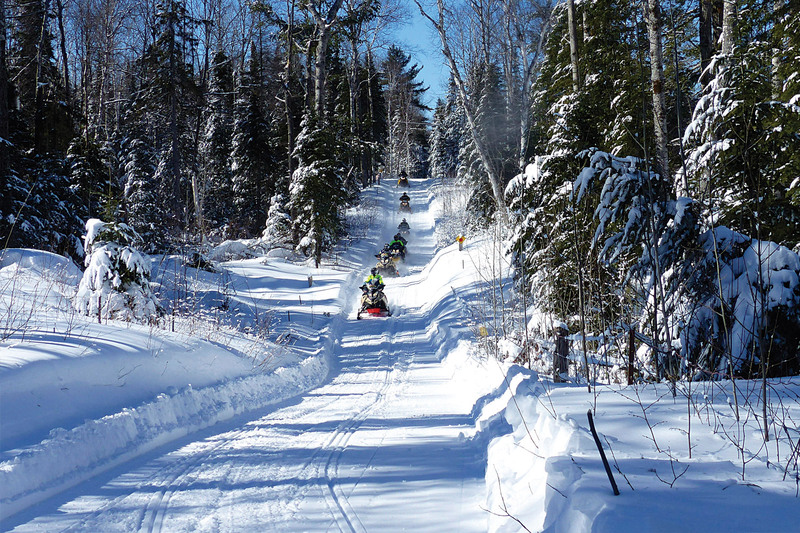 Built on many old logging & mining roads and utility corridors, Algoma’s snowmobile trails are perfect for big milers in search of two to five-day epic rides. Where To Ride: Weekenders need look no father than the OFSC-Promoted North Shore Loop (277 mi + 93 mi when staging out of Sault Ste Marie). For a longer ride, head north to Chapleau, Dubreuilville & Wawa (home of Top Secret Boondocking). Everything about Ontario's Northwest is larger than life. It's a pristine wilderness of boreal forests and scenic lakelands where snowmobiling is what winter's all about. With TOP trails connecting every community and services aplenty, this is the place for riders looking to experience a new kind of sledding adventure. 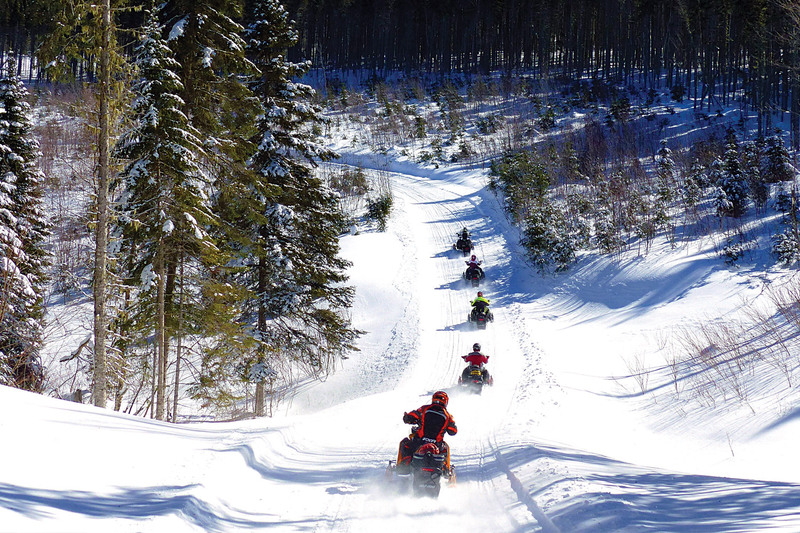 Where To Ride: This destination's premier ride is the OFSC-Promoted Snow Tour known as the NWOSTA Wilderness Loop (563 mi), which takes in 13 of the region's most snowmobile-friendly towns. Visitors should also check out the White Otter Loop (126 mi) north of Atikokan. 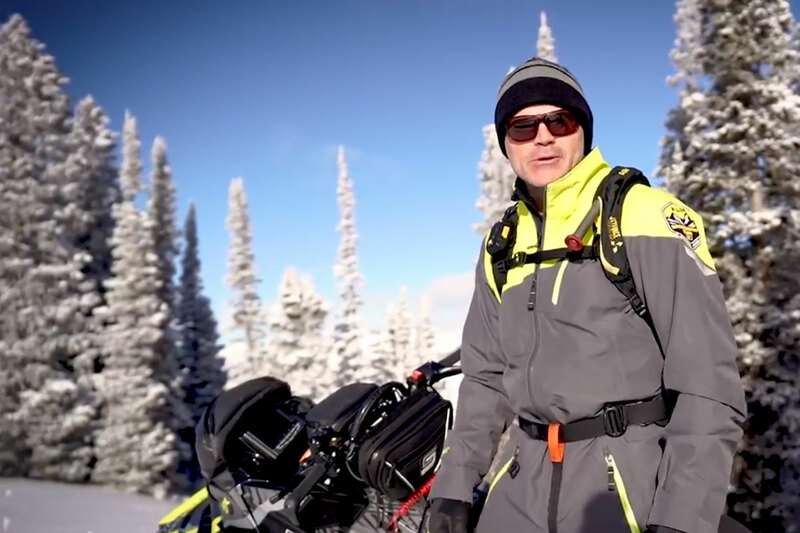 Widely known as The Intrepid Snowmobiler, Craig Nicholson is a powersports journalist and blogger specializing in snowmobile tours and riding tips.